Welcome to Native America: A History, published by Wiley-Blackwell in July 2017, a college-level textbook for courses in Native American History. The materials on this accompanying website will be useful to students and teachers who want to stay current with developments across Native America, read about exciting new scholarship in the field, and learn more about the topics they are studying in the classroom. Whatever your teaching or learning style, the materials here will complement the second edition of the book. I have never been a fan of textbooks, which might seem like a strange thing for an author of one to write. I seldom used them in my classes, usually choosing instead to assign to my students collections of documents and monographs. They are big, expensive, and tend to sacrifice narrative and argument in an effort to be comprehensive and non-controversial. When the opportunity came along to write this book, I thought long and hard about whether I should undertake so massive a project. We tend to specialize as historians. Most of my previous work focused upon the history of native peoples in Early America, and always in the eastern third of the continent. The volume of scholarship in that chronological and geographic field alone is massive, and to broaden my reading and research to include the period after the Plains Wars and the rest of the United States seemed like a daunting task. But I am grateful I wrote Native America, and I am happy that I have been given this opportunity to produce a second edition. I look forward to opportunities to update the textbook in future editions as more and more scholarship in this exciting field appears. My goal was to write a textbook that I would like to read, that my students would find interesting, and that complements what I do in the classroom. At Geneseo, I teach two general education courses in Native American history: The first is a survey course that follows the history from the earliest periods to the present, and the second a course that focuses on American Indian Law and current public policy debates in Indian Country. For both of these courses, Native America and the resources I have placed on this website are highly useful. I am happy to share with you what I do in the classroom. If you click on the Manual for Instructors and Students tab, above, you will see materials keyed to each chapter of the text. Each contains a chapter overview, a set of recommended readings for students who wish to learn more about a given subject, a suggested list of online and other resources that can be assigned to supplement the text, a list of terms that students should be able to identify, and a list of suggested discussion and writing topics. These materials can be used to reinforce the materials in Native America or to serve as the basis for writing and research projects. I tweet regularly under the handle @NativeAmText, and I update the blog periodically with commentary on issues of relevance to students of Native American History. Please consider following me on Twitter and have your students check the Blog. I want to provide students and teachers with materials that they can bring to their class discussions, and to use the web, in a fashion, to keep the textbook as up-to-date as possible. My hope is that this website will supplement the textbook by providing students and teachers with up-to-date information on the scholarship in the field, material for current-events discussions that point to the continuing relevance of the history they have been learning about in the classroom, and the perspectives of a college professor at a small, under-funded, liberal arts college located at what was once the Western Door of the Iroquois Longhouse, and who has been teaching this subject for more than a quarter of a century. I hope you find this second edition of value to you in your courses. I welcome any and all feedback and suggestions that you might have, as students or as instructors, for teaching Native American History. You can reach me @NativeAmText on Twitter or at my Geneseo email address. I would love to share your insights and your suggestions on this webpage. And if there is anything I can do to make your use of the textbook easier, please feel free to get in touch. I love teaching this subject, and love discussing it with my colleagues and with students. I look forward to hearing from you. Greetings Mr Oberg , I find it very fascinating the interest that you are bringing into light of the on going situations that we face day to day . It is very honorable to have a knowledgeable person speak out nd let U.S. Citizens know the struggle that fight every day . Thanks, Freeman. I hope that you will keep reading. 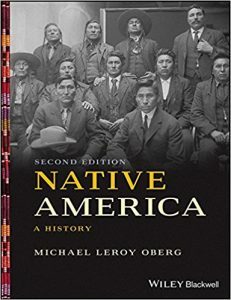 I taught Native American Studies for many years in a Connecticut boarding school. Recently retired, I am looking into teaching NAS in the Maine State Prison. Trying to select appropriate readings for that population has been a challenge. Might your book be a viable option? Over the years. I have use a wide range of resources, coupled with a close personal relationship with Zuni Pueblo, NM. Thanks for the note. I hope that the textbook works for you. If there is anything I can do to help persuade you to use it, please let me know. I have placed a lot of online readings for your easy access under the “Resources” tab on this website. I look forward to diving into your books and will be using them for quite a bit of my research. Thank-you for sharing your knowledge with us! Thanks for your kind words. I hope you find this site helpful.